Cassava plant growing shrub of the genus Manihot and also known as Tapioca plant, Yuca or Manioc. 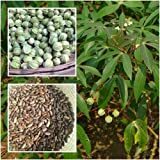 Cassava plant evergreen perennial but in a cold weather become deciduous, can grow in tropics mediterranean or subtropics climate and growing in hardiness zone 10+. Flowers color is white or purple, the flower has five petals and grow in clusters. Yuca leaves edible leaves with 5-9 lobes, sometimes the lobes very prominent and sometimes barely visible, depending on the cultivars, the leaves can reach to 15 cm. the leaves are green but in some cultivar are yellow-white in the inner of the leaf and some when the leaf is young are purple-red the stems of can be in purple-red.